Anyone up for dumplings? :) I know we are up for them a lot. Well, maybe once in a couple of weeks for sure. Manti (a.k.a. dumplings) are very native to Uzbek people. Although a lot of people associate dumplings with Oriental kitchen, the roots of this dish go to Central Asia and nomadic tribes of Timurids and Chingizids. It is believed that the latter spread the idea to other regions of the world while traveling. 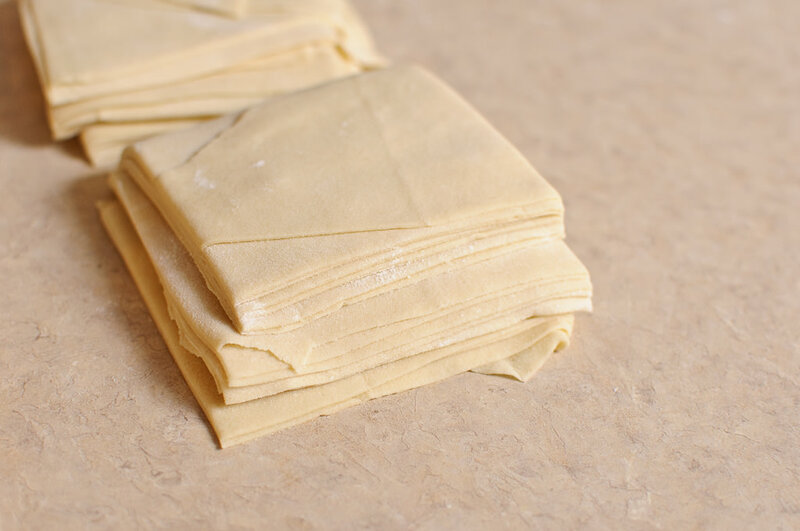 Although there are many variations of Manti in different cultures, the one filled with meat is the most common one I know. It is either filled with beef or lamb. Contains finely chopped onions and different herbs. 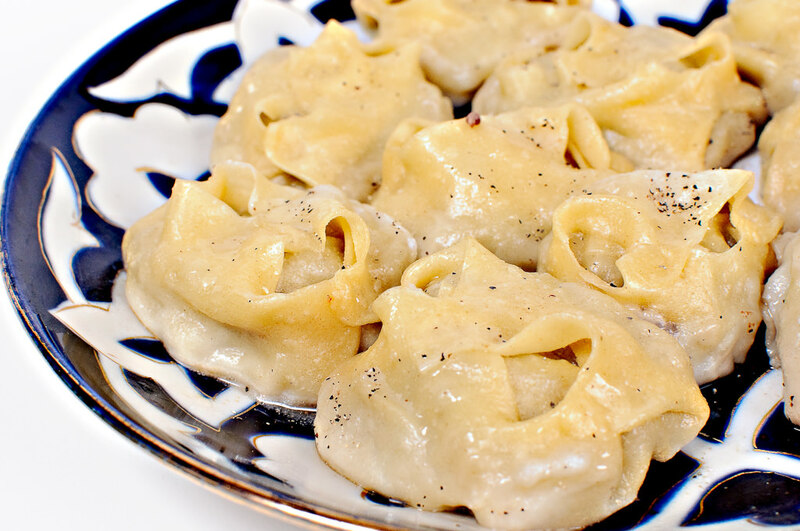 Turkish variation of Manti is much smaller and resembles Uzbek Chuchvara. I want to show the basic way of making Manti, involving more or less minimal efforts :) However, you have a to have a special multi-level steamer called “manti qasqon” or “mantishnica” for this recipe. It can be found in many Asian stores. I recommend getting one as it is very good for many other dishes starting from steaming vegetables, crabs, fish, food, etc. 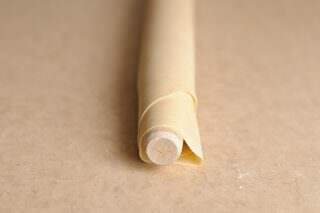 Bamboo steamers are fine too, but I heard that they have a distinctive smell when steamed and might affect the taste of Manti. Cooking and prepping time: 1,5-2 hours. 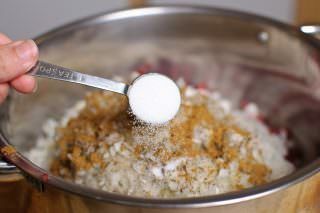 In a medium bowl mix together the dry ingredients. 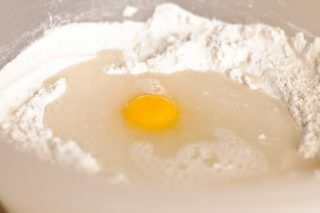 Make a well in the middle of the dry ingredients and pour the warm water and crack 1 egg. If you have a standing mixer or a machine to make the dough, utilize it. If you don’t, just mix everything well and knead the dough for 5-6 minutes. Kneading the dough well is important. The longer and better you knead, the easier it will be to roll the dough later. 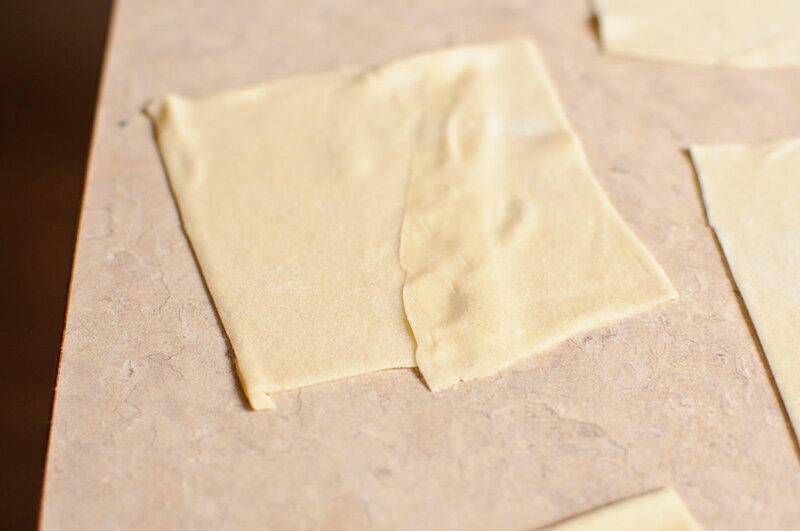 Cover the ready dough with a plastic wrap. 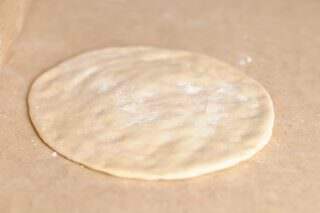 Let it rest for 10-20 minutes, depending on how soft or hard you made the dough. 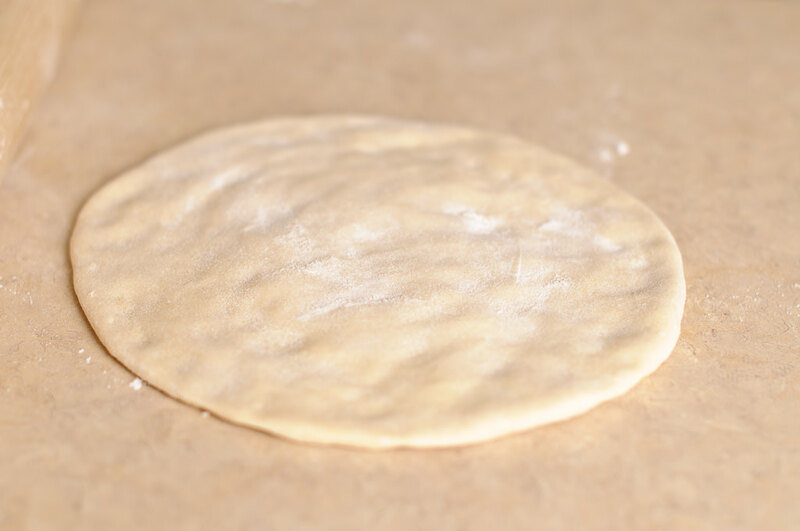 The ideal dough should not be too soft or too hard to work with. 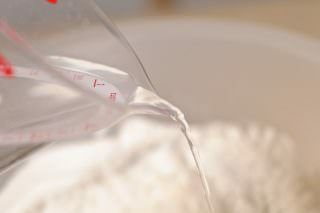 If your dough is very hard to work with, add tad bit of warm water, knead again until smooth and softer than before. Give it a good rest. Thinly cube the meat. It might be a little hard to do so while the meat is soft. You can slightly freeze the meat to make it easier to cut it into tiny pieces. If you have a food processor, utilize it instead. Just make sure not to ground the meat. 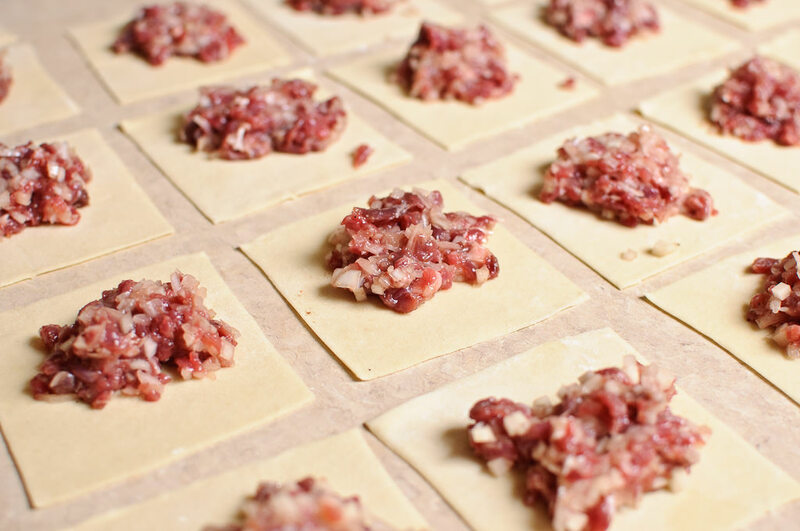 I particularly am not a big fan of ground meat manti. 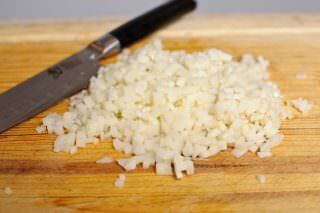 Same way as the meat, dice the onions thinly. 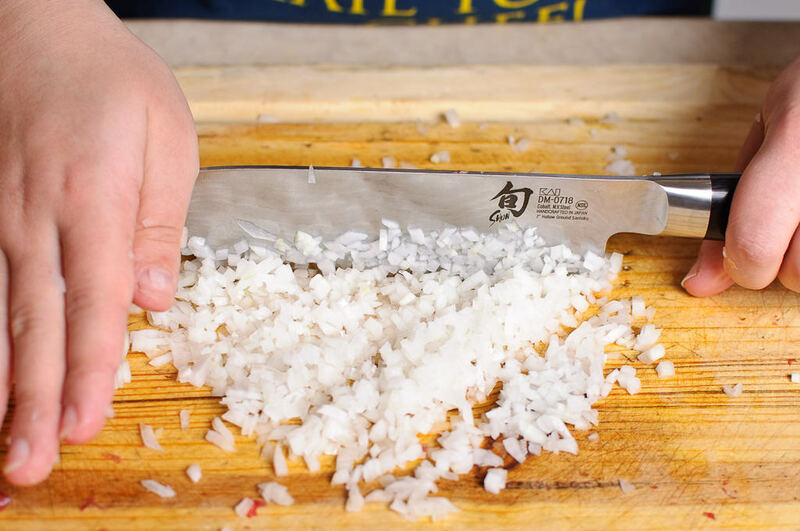 If the dices look a little chunkier, give a slight chop with your knife. Again, you can use the food processor for this task. 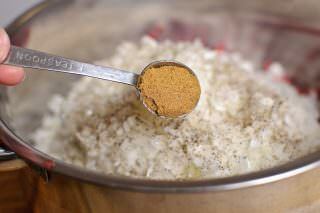 Place the onions in a medium container, add the spices and salt. Using your hands crush everything together nicely. This will ensure the proper cooking for the onions. The last thing you want in your food, is uncooked onions. Mincing the onions will also ensure proper fermenting of the meat. 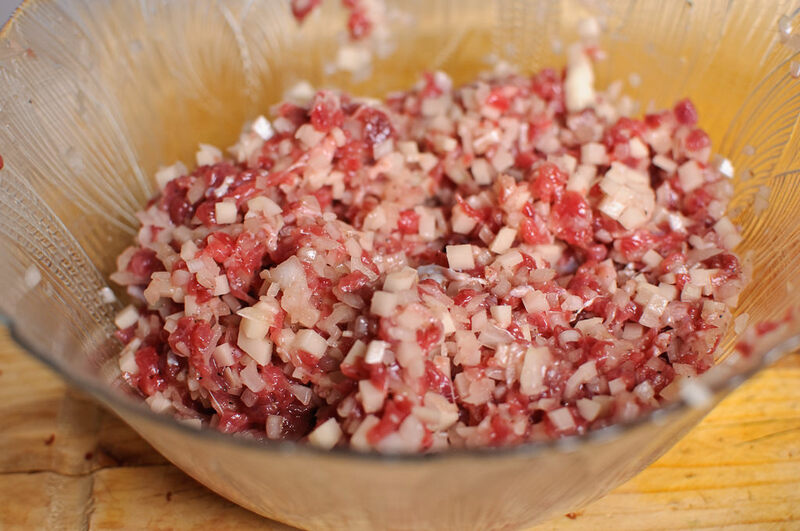 Since the meat is not pre-cooked onion juices will keep the cooking process of the meat faster. 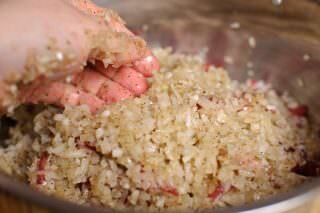 Add oil, add the previously cut meat and mix all ingredients well. I usually add potatoes if there are children partaking in the eating process. Since I have 2 boys, I always add potatoes :) Not a requirement, but it makes much softer Manti and a more delightful meal for the little ones. 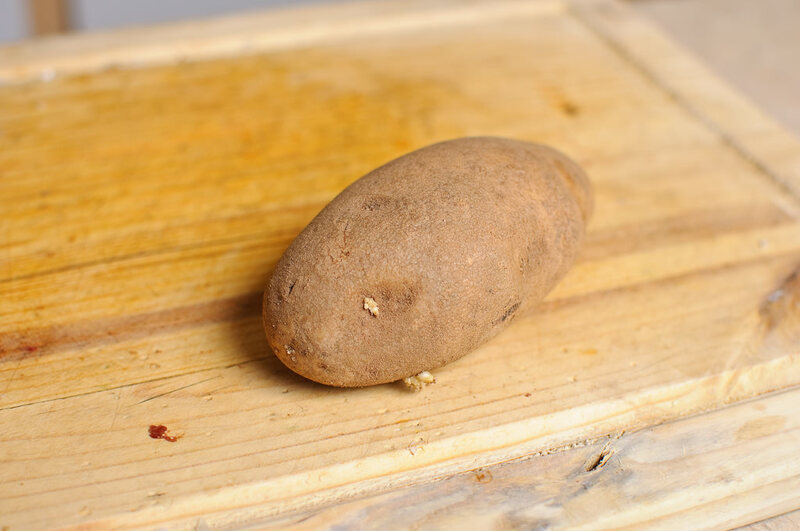 If you are using potatoes, cut them into small cubes. 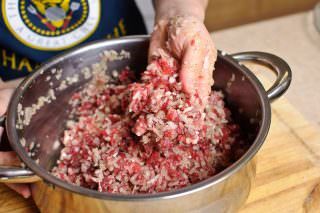 Separate half of the meat mixture into a different bowl, add the potatoes in one of the meat mixtures and mix well. Check if there is need for a little more salt. 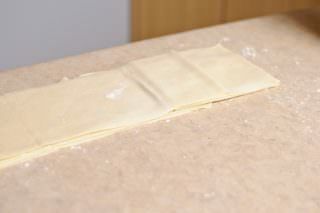 Cover the fillings with a plastic wrap and place them in the refrigerator until further use. 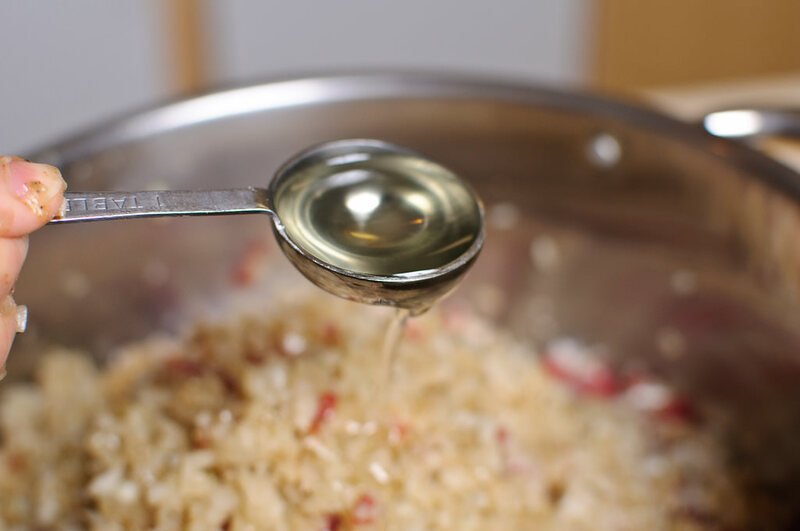 *Fill the bottom of the steamer with water (a little more than half). 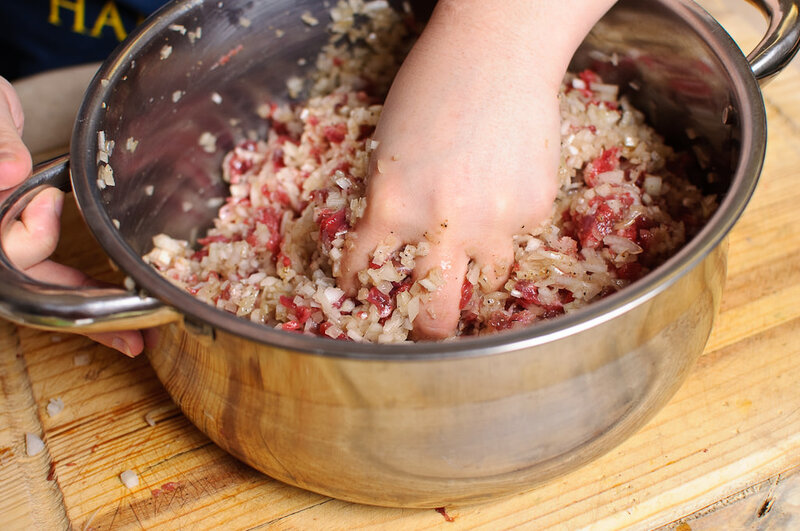 Bring to boil and simmer until the dumplings are shaped. 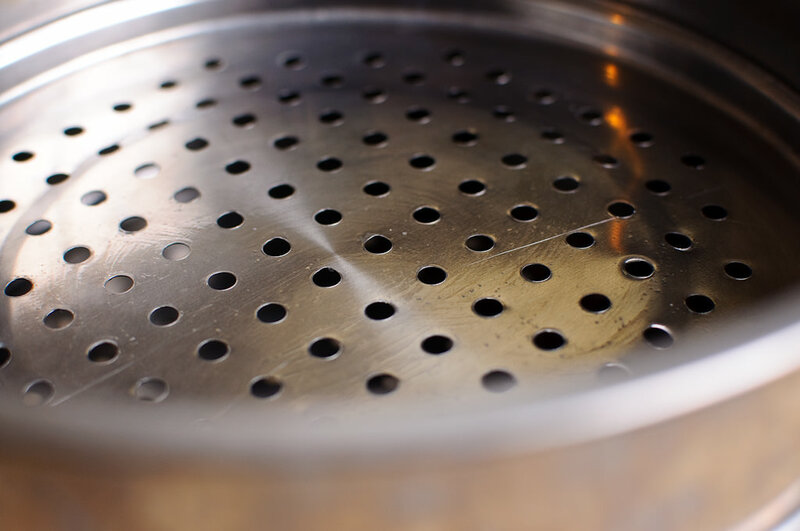 Grease the layers of the steamer disks with a little bit of oil. This will prevent the dumplings from sticking to the bottom of the disks. When the dough is well-rested, start getting it ready to be rolled. 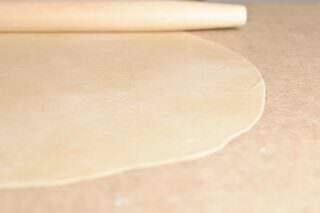 If it is easier for you to work with smaller doughs, cut the ready dough in half. Cover the other half with a plastic wrap. 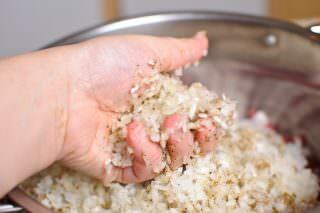 Flatten the one you are working on with your fingers and knuckles. Use flour as much as needed to prevent the dough from sticking (do not overdo it though). 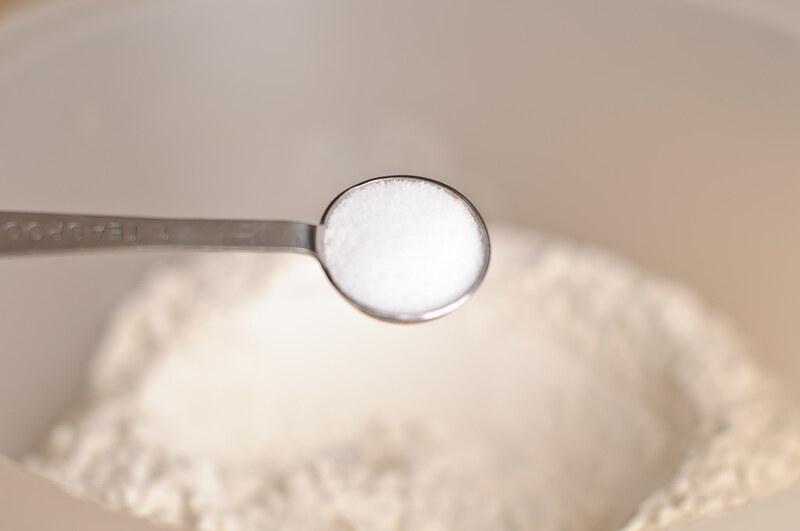 Sprinkling small amounts of flour when needed is preferable. I typically roll out a big circle. 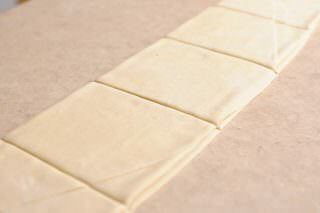 The process is more detailed in here Norin recipe dough. The process is the same. 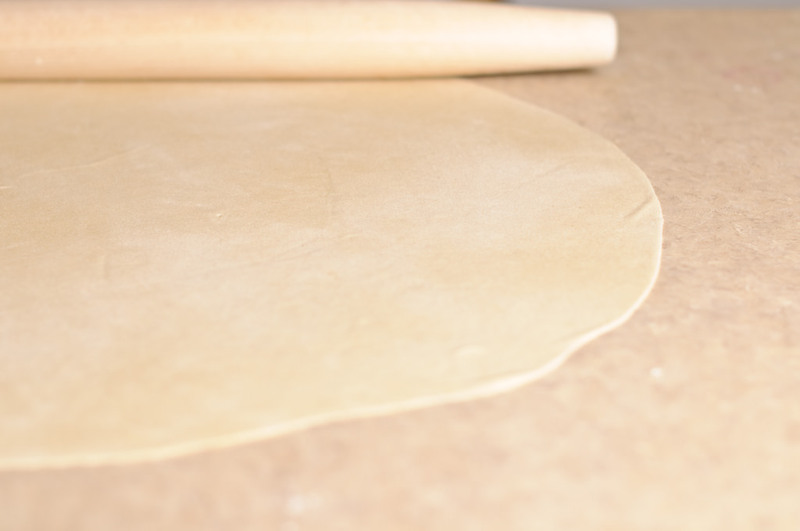 The thickness of the dough should measure about 2-3mm. Once the dough is ready, roll it around the rolling pin. Using a zig-zag technique, fold the dough on one parallel line. Starting from one end make 4,5 inch long cuts. 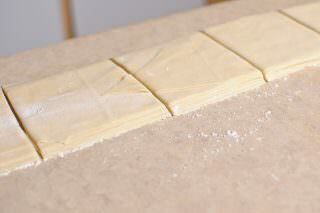 Move the dough out of your cutting surface to have more space. 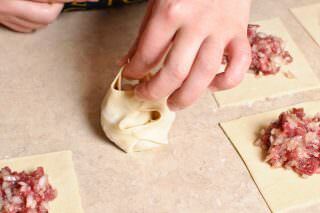 One by one start gently unfolding the dough lines, stacking them one on top of another in one line. Again make 4,5 inch cuts as before. 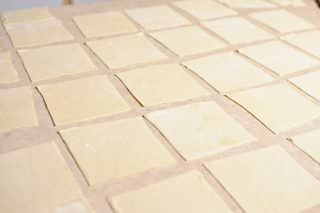 Now you have evenly cut sheets of dough. 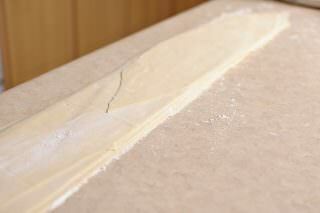 Spread the sheets on your working surface. 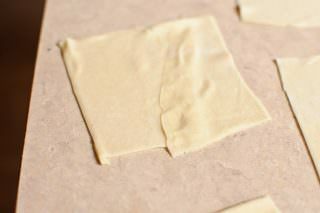 If you have small pieces of dough remaining, connect them to create a workable dough sheets. 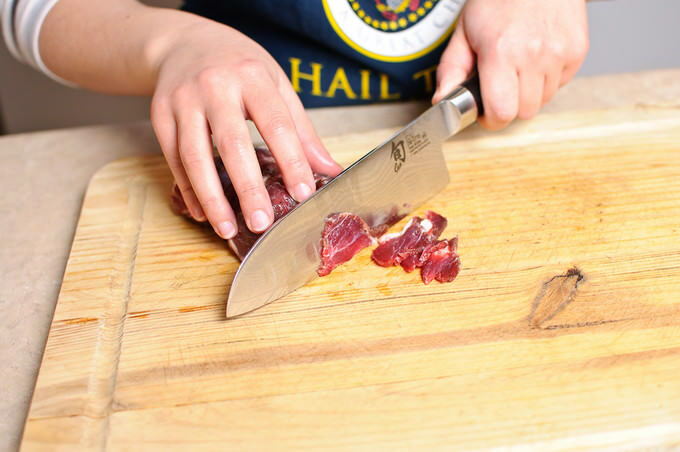 Take out the meat from the refrigerator. Place 1 1/2 Tbsp of meat filling on top of each sheet. 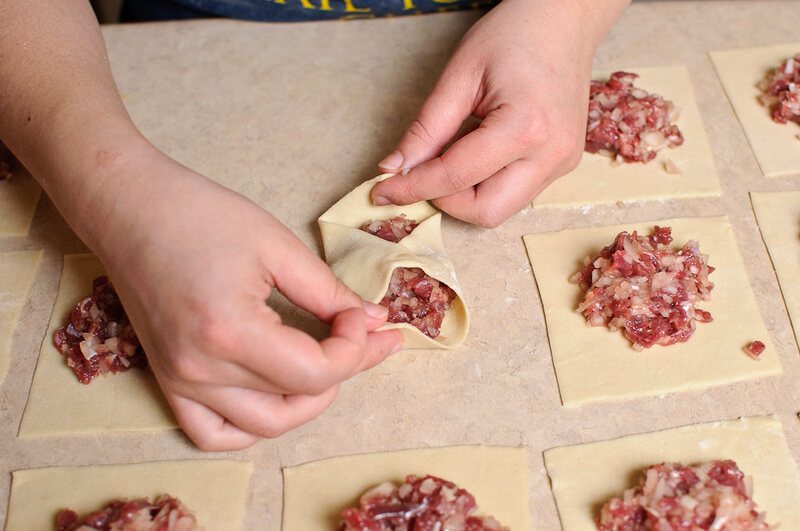 While shaping the dumplings pay attention not to flatten them. Your job is to be delicate and patient :) Connect two opposite corners by slightly pinching them together. 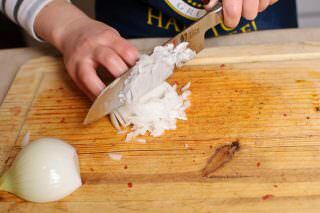 Repeat the process with the other corners. 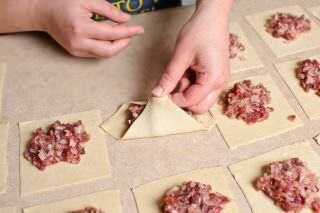 At this point the dumpling should look like a small envelope. 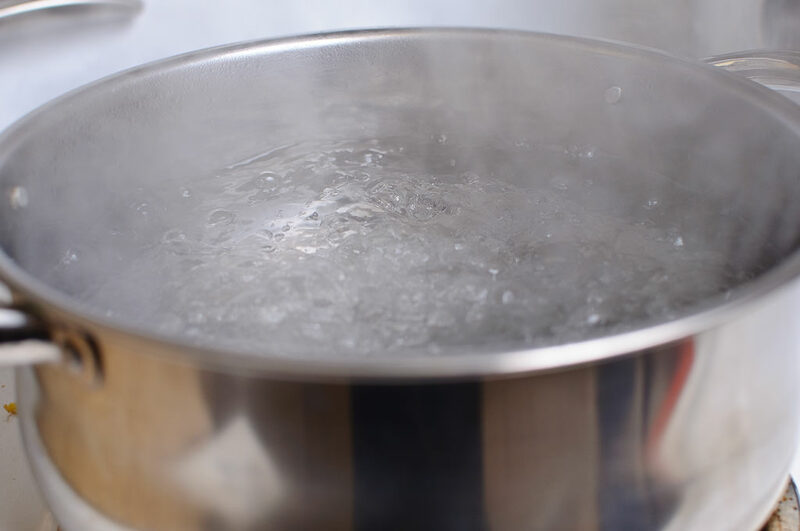 Bring the water back to boil again. 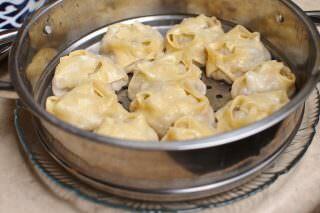 Stack the dumplings on top of the ready steamer disks, leaving a 0,5 inch space between each one of them. I usually use all 4 layers. 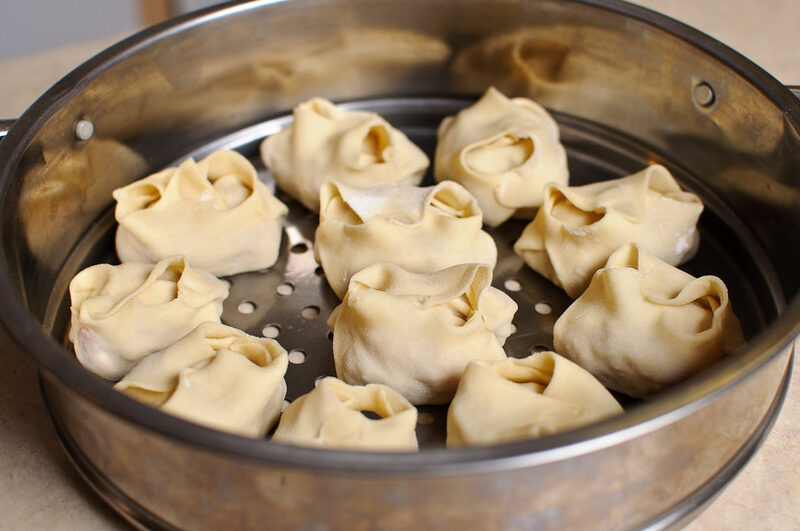 Stack the disks with dumplings on top of the boiling steamer pot. Set the timer for 45 minutes. When the time is up, turn the steamer off. You should not leave the dumplings on top of the water pot. The dumplings will get wet and it will be practically impossible to remove the dumplings from the disks. 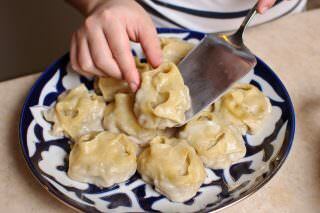 Instead, remove the disks and put them over a large empty pot, until all dumplings removed. 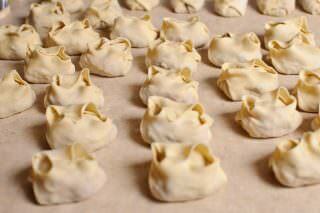 Manti/dumplings go well with yogurt, fried tomato+onion+herbs mixture, sour cream and various salads. 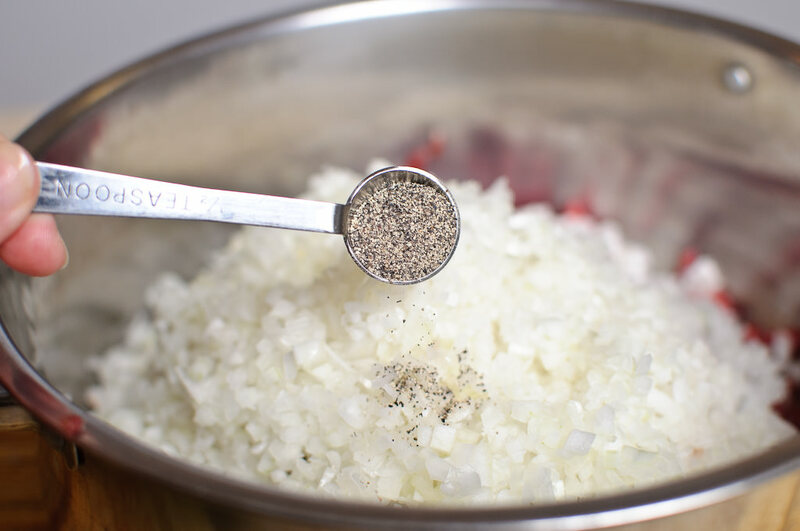 Sprinkle some ground pepper right before you serve. I hope the instructions are easy enough. It might take some getting used to first couple of times. But it will become a breeze!!! Yes please to these dumplings! Wizzy, come over!! WE will have a lot of it :D I also love the “green” dumplings. Those are filled with, llliiitteee meat, spinach, cilantro, parsley, scallions, onions a little beet root leaves and herbs. YUM!!!! *I bet I could USE all types of fillings. 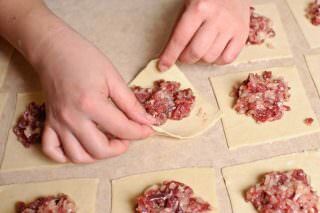 Filling wise, my most favorites ones are with green herbs and with some nice squash+onion+little meat!! Thank you a lot, Lola! As usual a good recipe and beautiful pictures! Katta rahmat! Spasibo bol’she za teplie slova, Anvar. 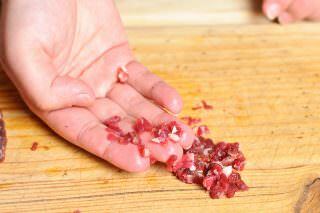 Primite i nash semeyniy vam privet! :) Budete v CO, zayezhayte v gosti! Будете в Южном Техасе, – милости просим к нам в Хьюстон. Мы здесь с 1999 года, до этого жили в Чикаго. I would like to make this but do not have a steamer pan. Where can one be purchased on line? I live in a rural area without any specialty stores. I’ve been following your photography and recipes, and really appreciate your effort to make recipes with so much detail and care. I am from Kyrgyzstan, living in the US. 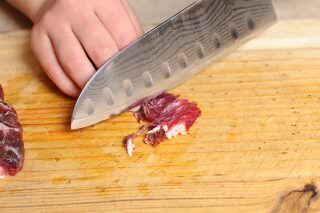 My favorite filling is chopped pumpkin mixed with fatty lamb, the pumpkin soaks up the lamb juice nicely. 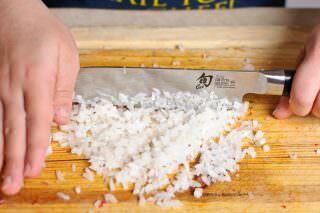 For my vegetarian friends, I use jusaai (Chinese chives), they love it. *Steamer – I found a good one, large 3 stack in Chinatown of San Francisco. Pretty close to kaskan. Thanks again for keeping the Central Asian tradition alive! the afghan version is called manto lol. i think its made the same but topped with garlic yogurt and tomato (and lentil i think!) sauce..
I’m dating a guy from Uzbekistan, and I’ve been trying to find a manti recipe that somewhat resembles his mother’s. I’m so excited to try this one out! Yum! My favorite dish in the world, when my mom makes them. I love manti, one of my favorites! I see you make them almost identical to how my mom makes them. I haven’t made them myself but really want to, just need to buy a mantishneca first. thanks for this post :) i will make it today !!! Thanks for such a great recipe. Can you please help me with a question. 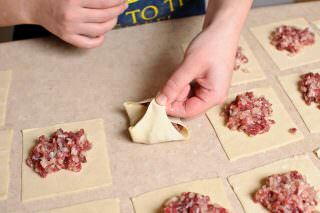 I want to do fried manti, can u give me a fried manti dough recipe? Or can I use the same dough? 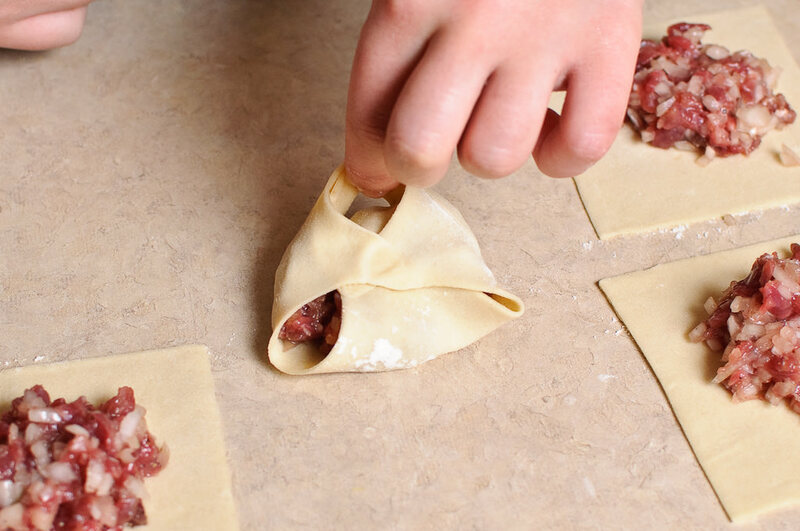 Yes, you can use the same dough. 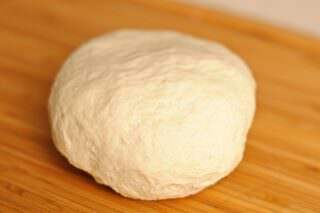 In fact this is the only dough I know of for fried Manti and Chuchvara. 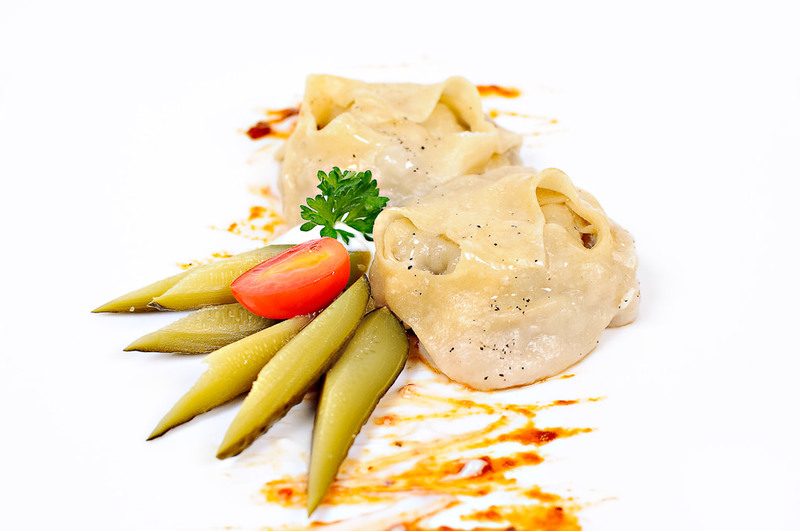 Just make sure that you are not using too much oil to fry the manti. Otherwise the filling will come out. I usually use a little bit of butter and fry it until golden on both sides. Thanks for your recipe! I tried with squash and it turned out very well. Can’t wait to make your golubtsy this week and your pide. By the way, have you made a lepeshka yet? Can’t wait to hear from you. Best wishes! 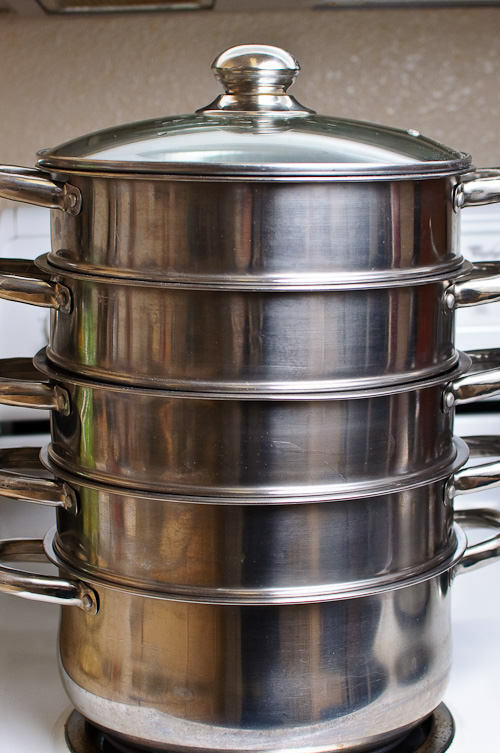 Your best bet is to buy the steam pots from your local Asian stores. I wouldn’t buy them online, as they might come bent or damaged. 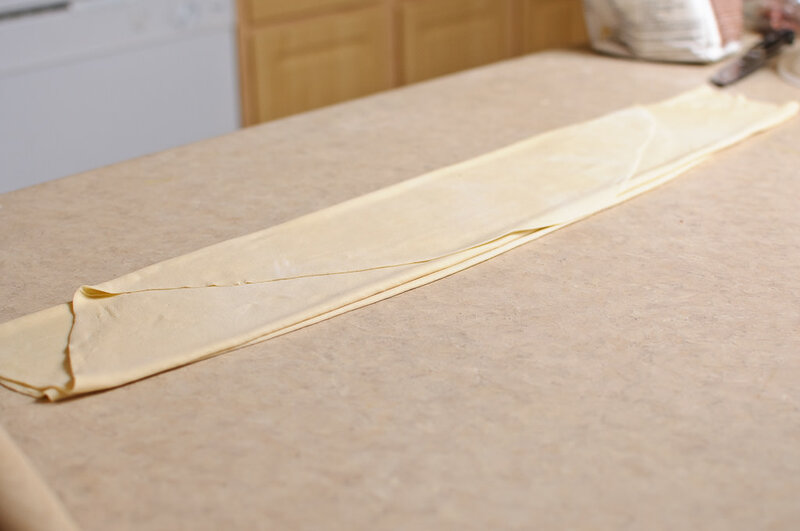 If it has a slight bend (and not properly padded during shipping) the steam will leak out while cooking, and result in uneven and under-cooked food.